Looking to get inspired for a nice wedding hair accessory? Or maybe just interested in how brides dress up for their big day around the world? Then keep on reading, because we’ve gathered some interesting traditions from around the world. Different cultures, different traditions. There are many hair accessories in various shapes and colors traditionally used for weddings. It’s quite interesting how different wedding accessories can be depending on where you are getting married. Even if you don’t choose any of the below hair traditions for your own wedding, they just might give you some inspiration! Here comes a selection of traditional wedding hair accessories from all over the globe! Would you dare to shave it all off? The Maasai brides of Kenya and Tanzania certainly do! They shave their heads for their wedding day to show humbleness. That certainly takes care of any bad hair day worries, doesn’t it? In addition to that, they rub some animal fat on their foreheads for fertility. Another quite practical tradition is wearing a perfectly styled wig covered by a traditional headwear. Japanese brides, getting married in a traditional Shinto style wear these for the traditional part of the ceremony. Nowadays many brides have a traditional ceremony in a shrine, followed by a glamorous blast in a church. And jumping over to the brides in Caucasus – they cover their hair with a white tower-like traditional hat! Chinese brides, on the other hand, tend to wear a big headpiece on their forehead. 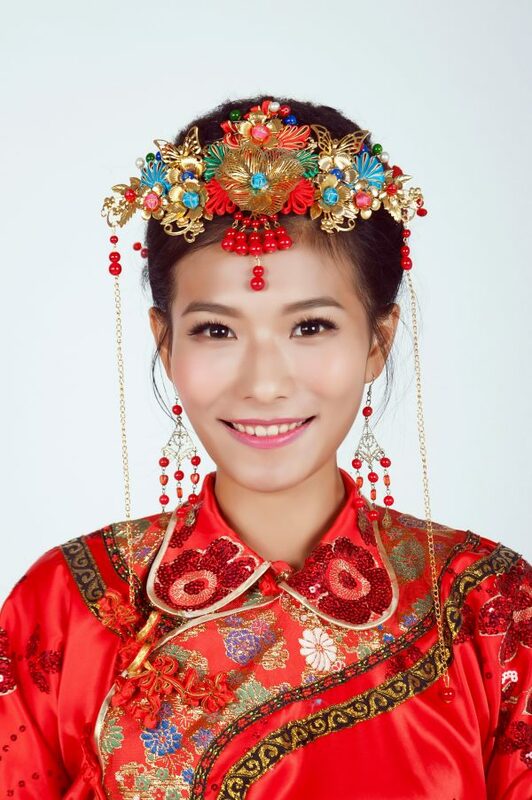 Traditionally, Chinese brides have been using a red and gold combination for their wedding day and the headpiece is preferably made of these colors as well. When it comes to the best-scented wedding hair, there are two runner-ups. South Indian brides braid their hair using fresh flowers, medallions, and ribbons. It turns the hair into a beautiful braid with a mesmerizing scent. The other runner up is Indonesia. Balinese and Javan brides incorporate long strips of jasmine flowers into their hair because it symbolizes growth and life. Not only do the flowered braids look colorful and beautiful, they also smell lovely! Parts of the neighboring island of Sumatra, however, have brides wearing a few pounds heavy traditional golden crown. Looks amazing, but not sure how comfortable wearing it during the ceremony is. Nigerian brides are all about beads. It is a status symbol, of course, but it also has traditional functions like bringing good spirits. They use beads for jewelry, wedding dresses and in their hair. Often they wear headpieces made of many colorful beads. The beads fashion doesn’t stop in Western Africa, brides of Morocco tend to be covered in colorful beads and jewels as well. And some bling bling bling! Djibouti brides wear their family jewels in their hair on their wedding day. It’s all about the sparkles and glitz and they are completely covered in hair and facial jewelry made of gold.